DISC By-Laws – Delaware Invasive Species Council, Inc.
Changes to the DISC bylaws have been proposed, and will be voted upon at the February 15, 2018 meeting. Find the proposed changes HERE. Article I. Name The name of this Organization shall be the Delaware Invasive Species Council, Inc., hereinafter referred to as “the Council,” an incorporated nonprofit organization registered in Delaware. An invasive species is defined as an alien species whose introduction does or is likely to cause economic or environmental harm or harm to human health. e) To serve as an advisory panel for various interests concerned with non-native invasive species and review management problems and activities associated with such species and provide updated information for specific management needs. g) Notwithstanding any other provisions of this document, the organization is organized exclusively for one or more of the purposes as specified in Section 501 (c) (3) of the Internal Revenue Code of 1986, and shall not carry on any activities not permitted to be carried on by an organization exempt from Federal income tax under IRC 501 (c) (3) or corresponding provisions of any subsequent tax laws. h) No substantial part of the activities of the organization shall be carrying on propaganda, or otherwise attempting to influence legislation or participating in, or intervening in (including the publication or distribution of statements), any political campaign on behalf of or in opposition to any candidates for public office. Section 1. Any individual or institution shall be eligible for membership provided that such prospective member pays the required membership fee pursuant to Article XI Section 6, and provides all requested background information necessary to ascertain consistency with the membership categories listed below in Article III Section 2. All members in good standing shall have the right to vote. Individual members: Any person interested in or involved in invasive species management, research, regulation, consulting, or other related management support programs. Individual members are allowed to vote and hold office. Institutional members: Any accredited institution of learning, botanical garden, research institute, corporation, company, association, organization, interest group, partnership, public agency or governmental body that joins the Council under their institutional name. Institutional members are allowed one vote by a designated representative. A person may be an individual member as well as an institutional member’s designated representative. a) Student member: Any individual member enrolled at an accredited university, college or junior college, as a full or part time student who has an interest in Delaware’s invasive species problems. Student members are ineligible to hold office. 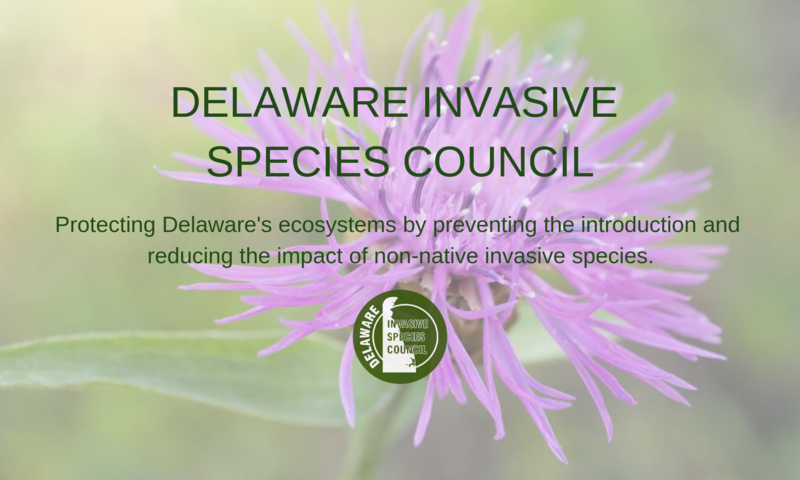 b) General member: Any individual or institutional member who has an interest in Delaware’s invasive species problems and who is committed to support the goals and purpose of the Delaware Invasive Species Council. All members in good standing are entitled to vote, in person, at all meetings of the Council. Section 1. The officers of the council shall be Chair, Vice Chair, Secretary-Treasurer, and Parliamentarian. These officers shall perform the duties prescribed by these bylaws and by the parliamentary authority adopted by the Council. Officers shall not serve as chairs of standing committees. Officers shall be members in good standing. Section 2. Officers shall be elected at the Council’s Annual Meeting in odd-numbered calendar years, to serve a two-year term which shall begin at the close of the business meeting at which he/she is elected. A simple majority of members present at said meeting shall elect. If a member cannot be present at said meeting, they may send their vote, in writing, to the Secretary-Treasurer prior to the meeting. Section 3. Officers shall be nominated from the voting membership. The Chair shall appoint a Nominating Committee consisting of three members to provide a slate of candidates for consideration by the membership at least 30 days prior to the Annual Meeting at which elections are held. In addition, there will be a call for nominations from the floor at the time of elections. Section 4. The Chair shall preside at all meetings of the Council and of the Board of Directors. He/she shall appoint and discharge all ad hoc or special committees (Article VIII). He/she shall be an ex-officio member of all committees. The Chair shall serve no more than two consecutive terms. Section 5. The Vice-Chair shall serve as Recording Secretary at meetings of the Board of Directors and shall serve as Program Chair for Annual Meetings. The Vice-Chair shall preside at Council and Board meetings in the absence of the Chair. Section 6. The Secretary-Treasurer shall take the minutes of Council membership meetings, maintain the membership list, and undertake such normal correspondence of the Council as is necessary. He/she shall be responsible for the funds of the Council, shall keep accurate records thereof, and perform other usual duties of the office. Section 7. The Parliamentarian shall serve as a Board member who advises the President, other officers, committees, and members on matters of parliamentary procedure. The Parliamentarian’s role during a meeting is purely an advisory and consultative one. The Parliamentarian assists with many questions that may arise in interpreting bylaws and rules, or in connection with the work of the Board of Directors and of its officers or committees. Duties may include assisting in the planning and steering of business to be introduced to the membership from the Board of Directors or any Standing or Ad Hoc Committee. In addition, the Parliamentarian shall be responsible for drafting and maintaining the organization’s by-laws, incorporating all duly transacted amendments. Section 8. Vacancies in office may be filled temporarily by the Board of Directors until the next stated membership meeting of the Council at which time an election to fill the vacancy shall take place. Section 9. Officers may be removed a two-thirds vote of the standing members present at any scheduled or special meeting of the council, but thirty days written notice of intent of removal must be given. Members unable to attend may mail in their vote. Section 1. The Board of Directors shall consist of the four officers of the Council and chairs of the three standing committees. Section 2. The Board of Directors is empowered to conduct the business of the Council between business meetings. Actions and decisions of the Board of Directors shall be made available to the Council prior to each business meeting. All actions are subject to review by the Council. Section 3. A simple majority of filled seats shall constitute a quorum of the Board of Directors. Proxy shall be designated by written communication to the Chair or the Vice-Chair. Section 1. The Council shall hold three types of meetings as follows: Annual Business Meeting, Scheduled Meetings, and Special Meetings. Section 2. An Annual Business Meeting shall be held for the transaction of Council Business. Elections of officers shall be held at the Annual Business meeting in odd-numbered calendar years. Section 3. Scheduled meetings of this Council shall be held at such times as may be fixed at Annual meetings, but if any meeting cannot be held on the date specified, the Chair may select the next available date. Section 4. Special meetings may be called by the Chair or upon the written request of three members of the council in good standing. Two weeks notice shall be required before all special meetings. Section 5. Within two months after the Annual Business meeting, information generated by the meeting shall be distributed to all members. The information shall include, but not be limited to, the minutes of the previous meeting, abstracts of meeting presentations, and any other information deemed pertinent by the Chair. Section 6. Meeting agenda and format shall be coordinated by the Chair and Vice-Chair. The notification and agenda for the Annual Business meeting shall be distributed at least 30 days prior to said meeting. Section 7. Approval of position statements shall require a two-thirds majority vote. Section 8. A two-thirds vote shall be required to allow the introduction of a motion that falls outside the council’s object as outlined in Article II. Section 9. Ten members in good standing shall constitute a quorum at any meeting of the council. Section 1. There shall be two (2) standing committees: Public Awareness and Education, and Data Management and Research. Each committee shall consist of all interested council members, including its Chair who shall be elected by the committee members. Section 2. The Public Awareness and Education Committee shall be responsible for developing and coordinating Council sponsored education programs in keeping with the purpose of the Council. Section 3. The Data Management and Research Committee shall be responsible for coordinating the compilation and maintenance of an up-to-date listing of, and other pertinent information for, those non-native invasive species known to occur in Delaware. The committee shall ensure exchange of information with other agencies and councils. In addition, the Committee shall be responsible for coordinating Council programs focusing on high priority issues or species. The committee shall identify programs of other organizations that merit Council support, and shall draft position statements for Council consideration. Ad hoc or special committees shall be appointed by the Chair as deemed necessary to carry on the work of the Council. Section 1. Suggestions for changes in these bylaws shall be submitted to the Charter and Bylaws Committee for consideration. If deemed appropriate, the committee will draft an amendment for approval by the Board of Directors. If approved by the Board of Directors, amendments shall be submitted for approval of the Council members in accordance with Article X, Section 2. Section 2. These bylaws may be amended by a two-thirds vote of the standing members present at any Annual Business meeting. In every case notice of consideration of a change, and a copy of the proposed change shall be sent to each member no less than thirty (30) days prior to said meeting. Section 1. The collection and accounting of all funds of the Council shall be the responsibility of the Secretary-Treasurer. Section 2. The Secretary-Treasurer shall maintain all records of funds collected and disbursed by the Council. A financial report shall be given at the annual business meeting. An audit committee appointed by the Chair shall review the books prior to the Annual Business Meeting. Section 3. The signature of any two officers shall be required for the disbursement of Council funds in excess of $1,000.00. Any officer can disburse funds for Board approved expenses up to and including $1,000.00 without the co-signature of another officer. Section 4. The Council shall have the right to set and collect membership dues. Section 5. The Board of Directors shall establish a membership fee schedule for each of the membership categories (Article III), in accordance with the provisions of Article V. The Board may, at their discretion, amend or revise the membership fee schedule from time to time. Section 6. The Board of Directors may solicit voluntary contributions, grants, or donations to augment membership fees in order to pay for the activities and functions of the Council. Section 7. The fiscal year for the Delaware Invasive Species Council shall be January 1 through December 31. In the event of dissolution, all of the remaining assets and property of the organization shall, after payment of necessary expenses thereof, be distributed to such organizations as shall qualify under section 501 (a) of the Internal Revenue Code of 1986, or corresponding provisions of any subsequent Federal tax laws, or to the approval of a Justice of the Supreme Court of the State of Delaware.